First as a student and then as a resident of France, this translation always struck me as slightly irreverent. I understood its Latin roots (Ite, missa est – “Go forth, the Mass is ended” – gives the same root of the word for both French and English). But every time my roommates asked if I was going to “la messe,” the word always landed awkwardly on my Anglo ears. Because Mass was anything but messy! Quiet and calm, peaceful and prayerful: these were the mot juste to describe Sunday mornings. Way back then – in cool stone churches full of holy hush, pews lined with the reverent faithful, prayers intoned with perfect pitch, solemn and sacred – the whole point of Mass was that it was a foretaste of heaven. And I soaked up its beauty like the bright-eyed girl that I was. Now? Mass is a mess. With two squirming kids in the pew and a bored baby in our arms, we are living a different definition of that French faux-translation. Stuff gets dropped, spilled, scattered, and torn. Tears are shed, fits are thrown, whispers turn to shouts and (worse) screams. But lately, as my husband and I try to stay faithful to the parental duty of herding cats in the pew while we half-hear the homily, I find myself seeing this holy sacrifice reflected in a whole new light. Because our life at home is a mess, too. No sooner is Mount Laundry conquered than the baby soaks the sheets. No sooner is the kitchen floor mopped than muddy sneakers smudge trails from the back door. No sooner are the bathrooms scrubbed spotless than they are invaded by an eager tooth-brusher, a reluctant hand-washer, or – worst of all worst – a sick child who almost made it to the toilet. We adults try to keep up, but kids rule the roost when it comes to livable levels of clean. Living in the mess can be a sacrifice. I idolize living without clutter, but I am called to live within chaos right now. Because the contours of my life these days circle around three small children and all the work that comes with loving, teaching, feeding, cleaning, and caring for them. This is the sacrifice I’m called to – to let go of my need for control and to let growing children live in all their wonderful mess around me. It will not always be this way. Some day I will clean the house, and it will stay sparkling for a week. Some day I will have a single laundry day rather than an hour each evening spent washing, drying, and folding whatever three small bodies have produced. Some day, I hope, I will be delighted to discover how my grandchildren turn the house upside down with their visits, too. But today? We are living in the holy sacrifice of the mess. Sometimes I catch glimmers of what an un-messy life once was or what it might be again. The shiny kitchen counter after I wipe it clean at the end of the night. The quiet moment of prayer in a suddenly empty house after everyone rushes outside to play. So can I let my expectations slide in the church pew along with me? To embrace the holy sacrifice of the mess there, too? I’m trying. I catch the eyes of tired parents around us, and I know they are, too. We smile ruefully at each other while we wrangle a runner heading up for the altar or a toddler toppling over the back of the pew. We know this is hard and holy work, living the sacrifice here and the sacrifice at home. And we’re trying to trust – perhaps as all of us do who try to follow in faith – that the outward chaos of our lives does not define our inner center. Because a life full of love and service and sacrifice does not have to look beautiful to be good. So into the mess we go, where life is still holy. Are you there, too? This is definitely a struggle for me (and I only have one child; I can only imagine how much more of an issue it would be with three!). I can usually keep the house fairly clutter-free, but I get so frustrated when I set up organizational systems that my husband and son fail to maintain. And then there’s the constant dirt they track in, right after I’ve vacuumed…yet I know that the alternative would be a clean house without children, and I certainly don’t want that. Thanks for an important reminder. The story of my life, Claire! I am always convinced the perfect organizational system will change my house/life, but really I’m slowly learning that it’s about reshaping my attitude and my need for control. So true. I have been trying for almost two years now to give up control when it comes to a clean and organized house. It is indeed holy work and a holy sacrifice. Thank you for the reminder! And I love the new banner! Looks great!!! Absolutely, Anna – I am right there with you. I think this will be the work of a lifetime for me, learning to let go! As I prepare to be a first time mommy I’ve been absorbing your blog like a sponge. Thank you for the gift of your words and heart. Samantha, thank you so much for your kind words! I’m delighted you found your way here. Blessings on you and your child. 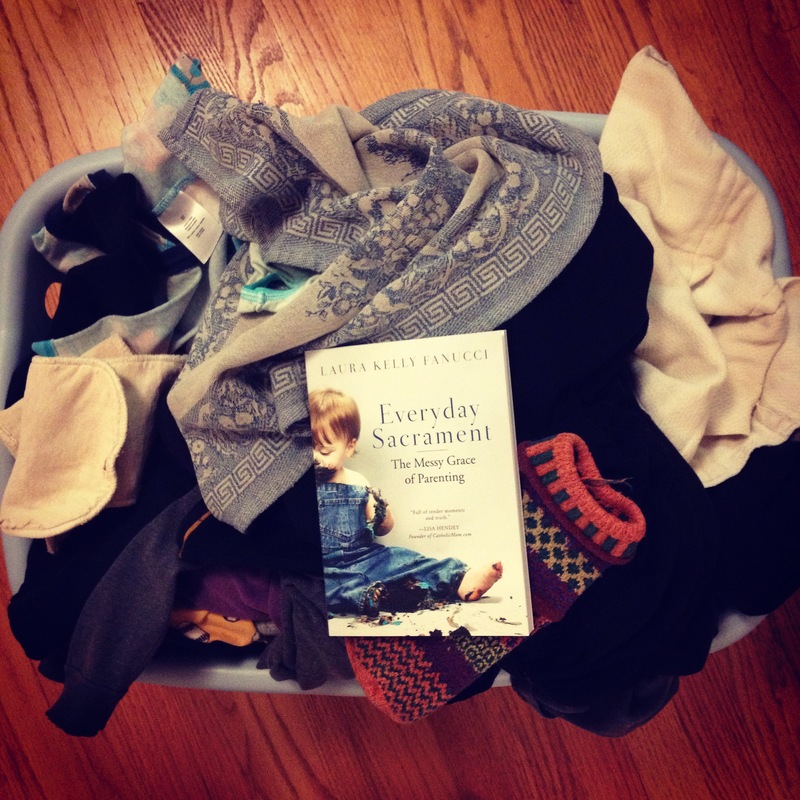 This is spot-on for me, and I love how you’ve reflected on life as a mother and redeemed the mess. 😉 It’s a good lesson for me, as I’m sitting here exhausted and wanting a nap, but desperately needing to finish making dinner and cleaning up the counter. Oh, Gina, isn’t that the truth? We are always exhausted. There is always so much more to do. But it’s still such good work. And we don’t have to do or control it all, since ultimately it is in God’s hands. Thank you for stopping here!